June is bereft of bright targets. The countless galaxies of May are rapidly fading to the west while the bright nebulae of summer are yet to appear. Nevertheless, many of the unique galaxies of June are well worthy of attention. Giant galaxy M101 is the best target this month. 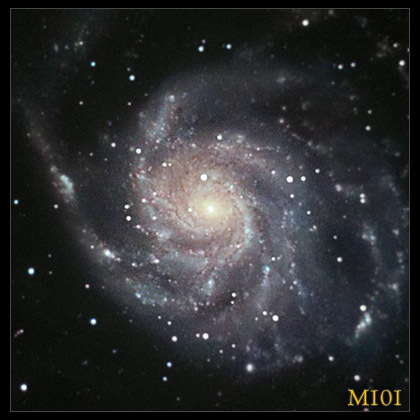 With an apparent diameter equal to that of the Full Moon, M101 shows details in its beautiful spiral arms that are far too small to see in other galaxies. Unfortunately, its great size paradoxically makes it difficult to capture, both because a wide field of view is required and because its faint light is spread out over a wide area. Fast, short focal-length telescopes are best at capturing this magnificent galaxy. Three nice edge-on galaxies also appear in June. NGC 5746 looks like a smaller version of NGC 4565, while NGC 5529 looks like a thin (and faint) silvery needle. Most interesting is probably NGC 5866 which has an impossibly thin dark dust lane crossing its edge-on disk. NGC 5866 is also interesting historically because it is believed by some to be the object that Charles Messier named M102 (while others believe that M102 was just a duplicate sighting of M101). One challenging but rewarding target in June is the pair of interacting galaxies known as Arp 271 (or NGC 5426 and 5427). The galaxies in this pair are close enough to touch and deep exposures show faint tendrils connecting their spiral arms. If we could fast-forward millions of years we would see these two crash into each other, wrecking havoc on their beautiful symmetry. Finally, one of my favorite targets in June is the Draco Group of galaxies. The elliptical galaxy NGC 5982 sits in the center while an oblique spiral (NGC 5985) and an edge-on (NGC 5981) flank it along a 15 arcminute line.